3. Is That What You're Wearing? There are certain questions that are labeled as “loaded.” These questions, by their very nature, are sure to cause trouble, stir the pot, enable things to get a little loud. “Why did you vote for so-and-so?” “Why can’t that team ever show up in the big game?” “Did you think he would change?” “Did your mother ever really like me?” There are more - many more - but you get the idea. Few things will get a really good domestic discussion going than the carefully placed question. We learn this, of course, the hard way. The early teenager is preparing for the big dance. Hours are spent in hair and make-up and primping. Then the teenager appears and the parent, quite innocently, asks the question, “Is that what you are wearing?” A that moment, the gates of hell fling wide open and the evening is ruined for everyone involved. But not to worry. A few years later, the parents are getting ready for a big night out. There’s lots of adult primping and preparing. Challenging decisions have been made concerning wardrobe. The parents appear - ready for the great celebration - and the now older teenager looks at them - mortified - and repeats the question that has been carefully taught: “Is that what you are wearing?” The parents, of course, can’t see anything wrong with their attire, which is - of course - the entire point when the roles were switched a few years back. But the parents go through the night wondering if they really look as ridiculous as their offspring would lead them to believe. As I worked through the troubling parable of the Kingdom of Heaven that is at the heart of our worship this morning, I have to confess to a certain amount of head-scratching. It’s the Parable of the Wedding Feast, according to Matthew, and it’s not an easy parable with which to deal. But, let’s give it a try. Not unlike the Parable of the Workers in the Vineyard, the Parable of the Wedding Feast begins as we might expect. Remember that it is a parable - a story - not history. And a parable always has a twist or two - the unexpected moment. The story begins with a proud parent giving a wedding feast for his son. The preliminary announcements have been made - the “save the date” card has been sent - all of the essential etiquettes have been observed. The party of the century has been announced and prepared. When the invitations arrive, those invited “made light of it,” we are told. They joked about the invitation and the occasion. That was, of course, as great an insult then as it would be now. Messengers are sent out to call the invitees to the banquet, but only excuses are offered. Some just walked away. Some felt compelled to work. Others grabbed the messengers and mistreated them and killed them, we are told. Ungrateful invitees if ever there were. But the tables were set and the caterer had delivered the food. So the king instructs more messengers to go out into the streets and gather whoever can be found to fill the wedding hall. So, out they went and in they came. Stop the parable right there and it’s not hard to divine a potential meaning. If we observe custom and see in the character of the king something of God, it’s pretty easy to see that the parable is about the rejection of God’s grace by humankind. The “invitation” can be seen as grace and the unwillingness of people to fully receive that gift is a rejection of God’s will and way. The messengers might be seen as the law and the prophets, given to help the people experience God’s grace. The words of the scripture, “seized…mistreated…killed” might lead us to think about the treatment that Jesus himself received. Sending out messengers to invite those outside the circle might make us think about the mission to the Gentiles - how God’s love and grace flowed beyond the ancient channels. The part about the king getting angry and killing people and burning the city is a bit problematic, as that doesn’t sound like the behavior God might pursue, but allow the storyteller some artistic license. Stop the parable right there and it’s not that hard of a story. People reject God’s love and grace all the time, but that doesn’t stop God from continually pouring out that grace. God’s invitation to authentic life and living is open to everyone and nothing can stop it. Bring the parable to an end right there and it’s a warm and fuzzy message of love, inclusion, and welcome - and who doesn’t want to hear that lovely bedtime story? But…the parable doesn’t end there. In fact, the parable takes a strange and unpredictable turn. The king’s messengers had just beaten the bushes to fill the hall with whomever they could find. Now there’s a dress code? Imagine: a guy with a bullhorn walks into any Walmart or Target, in America and invites anyone within the sound of his voice to board buses outside the store to be taken to a banquet. Once they get there, they are derided for what they are wearing. Even worse, when the king sees the improperly dressed fellow, he instructs the attendants to bind him hand and foot and toss him “into the outer darkness where there will be weeping and gnashing of teeth.” Why him? Were the other guests properly attired? If they had been herded into the banqueting hall, as the parable seems to suggest, when were they supposed to get the proper clothing? And if they were just the average people of the day, were they supposed to own the proper clothing? It feels funny. It seems weird. Is the Kingdom of Heaven about what kind of clothes you wear? Some Christians think so. Is the Kingdom of Heaven about how you wear your hair? There are those who would answer, “yes it does.” But, those questions and answers seem ridiculous when we are talking about the Kingdom of Heaven we have been hearing about - a kingdom of forgiveness and equality that we’ve proclaimed for the last two weeks. If God’s grace is about forgiving and seeing everyone as created in the image of God, what is going on with throwing out someone who is inappropriately dressed? Despite what we might believe at first blush, this part of the parable really has nothing to do with what the wedding guest is wearing. It has everything to do with offering a proper response to the invitation to the banquet. The question of the proper response is critical. It ties right back into the first part of the parable in which the invitation is rejected by those invited. The invitation was received with flagrant disregard, with deliberate indifference, with complete lack of appreciation. Those invited couldn’t care less about the opportunity before them. They reject the offer out of hand. The one who accepts the invitation is chastised because, sitting there at the table, ready for the party, the lack of a wedding garments seems to suggest a lack of appreciation and gratitude. The invitation was accepted but the behavior - in the form of what the guest chose to wear - but it seems the guest doesn’t want to stay at the party. Maybe the guest was wearing a t-shirt that said, “I’m only here for the food.” That is one way to look at this strange twist to the story. And what that may tell us is that in the Kingdom of Heaven, while the power of grace is real, and the equality of people is certain, a proper response to the gifts of God is also in play. When grace floods human life, that life cannot just go on as if nothing at all had happened. When we accept the grace of God - that invitation to authentic life - we cannot blithely travel the road we have always traveled. To ignore the invaluable invitation of grace and all that it means is to essentially say, “I’m only here for the food…the blessing…the good stuff.” It is to offer a response of ingratitude for this greatest of gifts. It is to demean God’s love and compassion and dismiss as insignificant God’s offer of regeneration and new life. To accept the invitation to the banquet - the offer of new life - comes at a cost - the willingness to follow a new path with new values and new approaches to life. 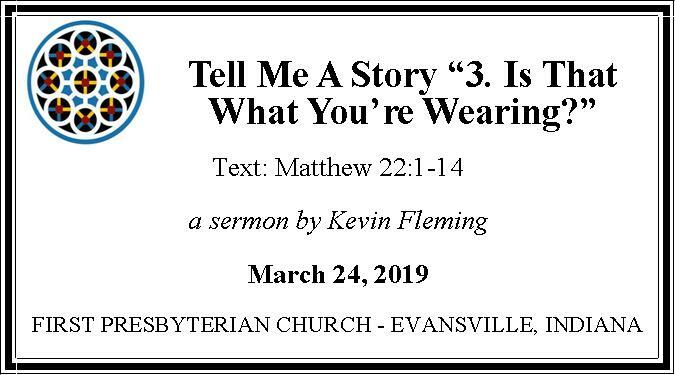 So, the question for the day is “What Are We Wearing?” If we’re wearing ingratitude, jealousy, or envy, we may be inappropriately dressed for the invitation we claim to have received. If we’re wearing injustice, falsehood, callousness, or indifference, we may be signaling that we really don’t want a place at the table. If we are wrapped up in self-interest, if we are concerned with accumulating more money, more property, and more power, we may be checking our watches to see when we can leave the party. But if we’re wearing gratitude, we are well-dressed. If we are wearing generosity, we are red-carpet ready. If we are wearing joy, we are ready to be the life of the party. If we are wearing love, we will not be sitting alone. Time to start looking good, friends. For now and evermore. Amen.